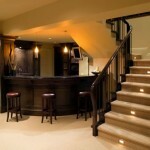 10 Man Cave Design Tips to Preserve Family Harmony | Your home, only better. Note: I recently contributed to an article in the NJ Herald about Man Caves. However, since I can’t link to it online, I thought I’d share part if it here. To see the pdf, click here (caution – it’s upside down). Man Cave (definition): A place where a man can be a man without apology or expectations. The man cave should incorporate his favorite hobbies, sport teams (such as this example), music, past accomplishments, really anything that reminds him of who is was and who he wants to become. This is a place for him to let his imagination and dreams run free. Before beginning the design, agree on a budget. Your marriage is worth it. Use his favorite colors. When in doubt, remember that darker colors hide more dirt. 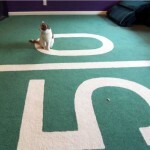 A strategically placed area rug over carpet gives double protection and creates a nice zone. Must have a chair that is more comfortable than attractive. And big. Don’t forget the mini-fridge and recycle container. Stereo and pre-marital music collection in milk crates are always classic. Use open storage so he knows what is where without having to ask you. Bookcases are ideal. Brag wall for photos, concert posters, certificates, favorite sport team paraphernalia etc. 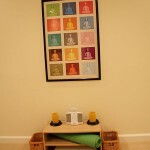 (note: paint a wall with magnetic paint – cheaper and more flexible than framing individual items). And the most important design rule of all: Man gets the final say, even if he’s wrong. He’s baring his soul and should not be mocked. It’s his tree house and girls aren’t allowed. Once you have your man cave, there are two things that must be negotiated as a family: 1) who will clean it, and 2) what is the secret knock. And ladies, don’t neglect your own Mom Cave. You deserve a special place too. Very nice article from the female point of view. I like it. Nice list. Definitely all about comfort. Guys like to be comfortable and lazy. Big screen, beer, lazy-boy. I like the football theme, you really went all out. I don’t exactly agree with the whole “man cave” phenomena that has hit recently. These rooms typically are not ever for just the men. A lot of the time these rooms are used by children or might even become their play room. The reason, I believe, being that the only reason a “man cave” exists is so the man doesnt feel as though the whole house belongs to his significant other. If men get a “man cave”, then women get “Women Mountain”… or something to that affect. Either way, man caves are an abomination… who want to sit in an area that feels like it belongs to a fraternity. 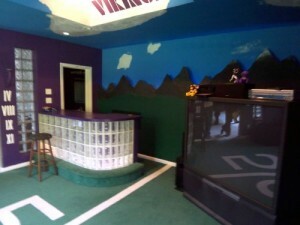 That football room was from a staging client, actually. I’m more of a Giant’s fan, but not to that extreme. Btw – “Women Mountain” is really “Kids Mountain”. Everyone needs at least a little slice of their home to be distinct-fully their own. Haha! Excellent. I don’t have a man cave, per se, but I do like to retreat to the [insert vacant room in the house here] on occasion and chill out. I would be offended, but “what is the secret knock” brought me back.